"Corna Muse are straight like bassanelli. They are covered below, and around the bell have several little holes, from which the sound issues. In sound they are quite similar to crumhorns, but quieter, lovelier, and very soft. Thus they might justly be named still, soft crumhorns, much as cornetti muti could be called soft cornetts." The cornamuse was clearly described by Praetorius, and is yet a mystery in these modern times, because none have survived to the present and because of the confusion of instrument names at the time. Different names which were used for similar instruments and similar names used for different instruments. 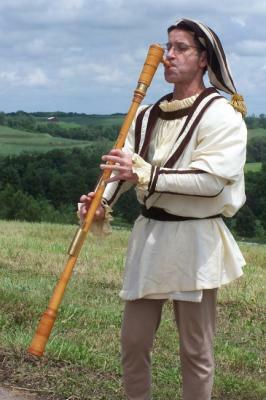 The name cornamusefrom the Latin cornamusa commonly meant bagpipe as in the French cornemuse. The use of the name dolzaina, from the Latin dulcis (sweet), is thought to be the same or a similar instrument to the cornamuse, and yet the name is often intermingled with the dulzan or dulzian of the curtal families. These two names were sometimes used in the same sentence, as in an ensemble consisting of dolzaina, cornamuse, shawm and mute cornett. Praetorius stated that the cornamuse has no keys. 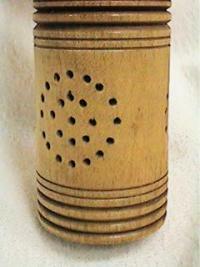 They came in several sizes, each having a range of a ninth similar to other reed-cap instruments. Musica Antiqua has an alto and a bass cornamuse in F which are reproductions by Gunther Koerber of Germany. 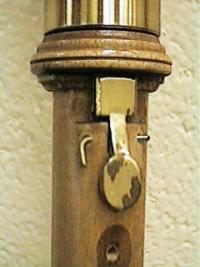 Notice that the Antiqua cornamuse have keys similar to those of the crumhorn family.